Jean is a local guide who provides the personal touch you will not get on a huge coach tour. Our itinerary was roughed out weeks before our arrival, yet, we were able to flex the times if needed. Like to avoid one site due a coach tour just unloading, so we could see another nearby without having to fight the crowds. As I have mentioned during the posts about castles, I am here to capture great photos. For me, that means no people or very few people in my shots. Enjoy these pics. Until next time, go see the WORLD....While you still can!!! The ANT 21 - Light Armour Pouch for the ANLI MG-270 Antenna. 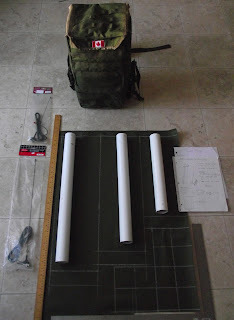 This antenna is designed to work with the BaoFeng and similar portable HAM radios. 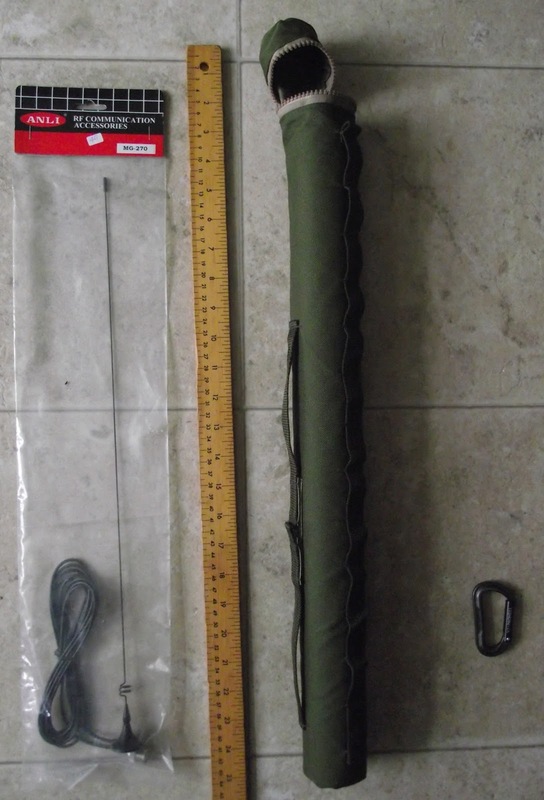 This antenna pouch is about 21", thus the tag of ANT 21. The last in this series will now be labeled as the ANT 24. The first one should be called the ANT 16. While the ANT 16 utilized outside seams for the top and bottom, just to ensure the 2" PVC pipe would fit; I am now comfortable to finish the pouch with inside seams. I believe using inside seams on the ends of the ANT 21 produced a cleaner looking finished product. Less chance for snow to build up. I have also made a few more notes on the plans and have included the update plans below. ANT 21 - Yes, It Fits!! The ANT 21 was constructed the mirror to the ANT 16. 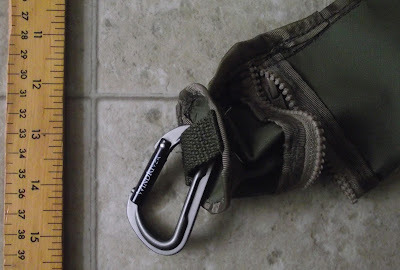 Meaning the hook & loop, as well as, webbing anchor straps were placed on the left of the pouch, so the finished pouch would mount on the right side of the Cubist Escape. Other than the longer/taller size and the addition of the webbing under the cap; this pouch was constructed the same as the ANT 16. First the fabric was laid out and marked. Then, the webbing and hook & loop pieces were cut. Frayed ends were melted in the flame of a candle. Next, the centre webbing was sewn to the fabric, spacing about 1 1/2" apart. 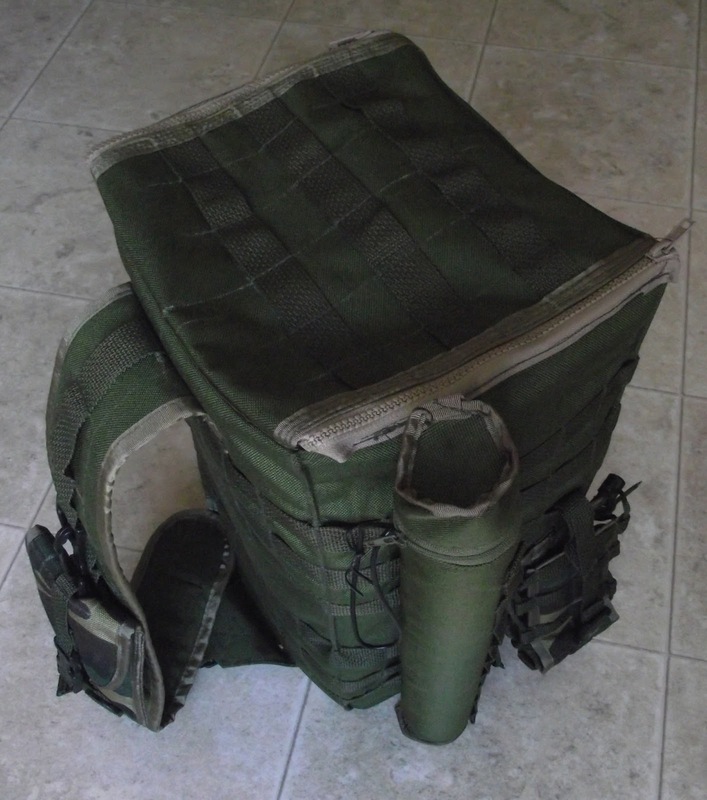 I pulled the webbing so it was not sewn flat, to make it easier to pass webbing straps through if mounting on another pack. Forth step, cut top from body and sew in the zipper. Finish with seam tape. Fifth step, goodside-to-goodside, sewn the main seam. Finish with seam tape. 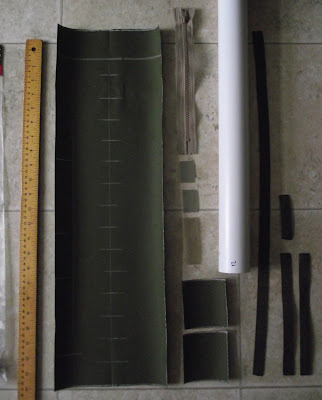 Next, use your tailor chalk and trace around the PVC pipe onto your squares of fabric, on the good side. Then, start to sew the bottom of the main body to the end piece (square of fabric). A third hand or a pair of forceps are quite helpful here. Finish with seam tape. Repeat, the same process with the top end piece. Remember to leave enough room to insert a finger to open the zipper once the top is finished. Next, revert the fabric so the good side in on the outside. 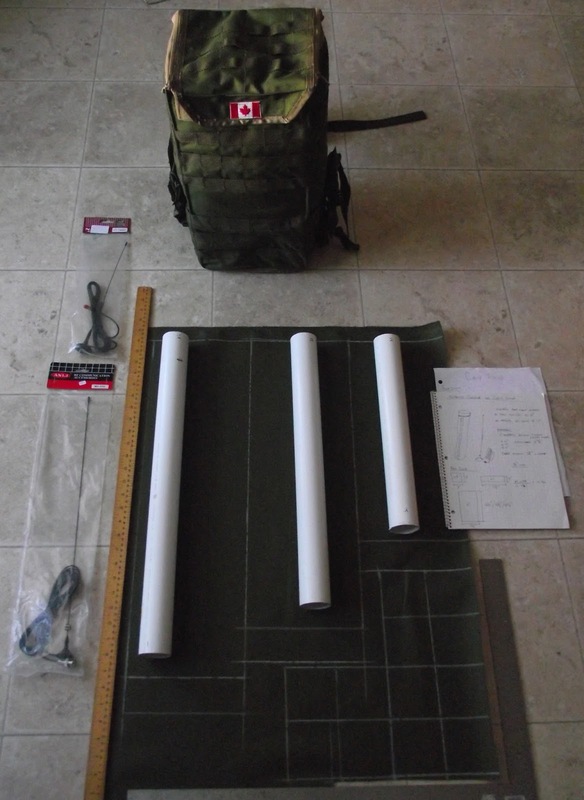 Insert the PVC pipe into the finished pouch and attach to your pack. This project took me about an hour and a quarter to finish, but I was taking my time, as well as, taking photos of each stage. Some of you out there could probably build this project, start to finish, in about 45 minutes. 20 years and I still sew slow. I hope this project has been helpful to some of you out there. I hope there is enough detail for you to build your own. Until next time......build something, and then make it better!!! 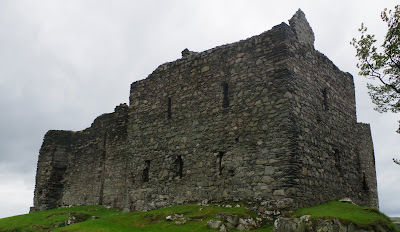 Welcome to Castle Sween, on the shores of Loch Sween, in Knapdale, Scotland; the last of my castles to Blog about. Castle Sween was built for/by Prince Sween of Denmark in 11th Century. The round tower on the seaside of the castle is named for Prince Sween. Before, there were any roads in this area, this castle would have only had to worry about attacks from the sea via Loch Sween, a loch that connects to the sea. The Danes that called this castle home, would have ensured to keep scouts watching the approaches for any enemies. In the 15th century, this castle came into the possession of one Alexander MacMillan. Under his ownership, had the castle expanded by building the large square tower on the back of the castle. This tower is now known as MacMillan Tower. Inside this tower on the lower level was where the great kitchen was built, with huge stone ovens and it even had running cold water. Later, the MacMillans, lost ownership of this castle. The Lord of the Isles and the Campbells factor into this change of ownership. 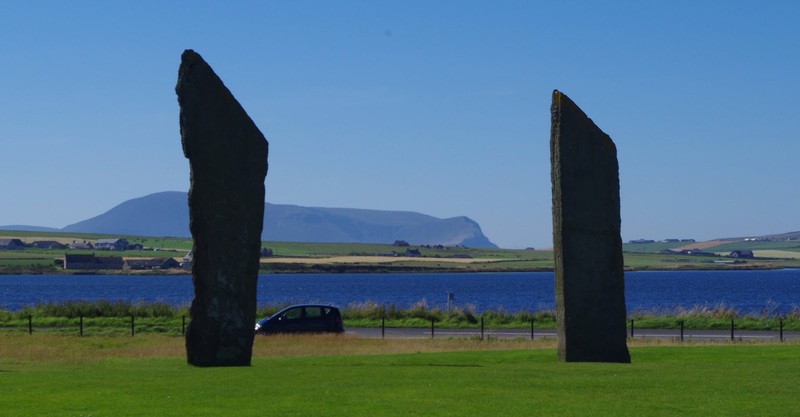 Legend has it an inscribed stone once stood on the shore of the property, which had words to the effect of.....So Long As Waves Wash Upon This Stone, Shall The MacMillans Claim These Lands.......or something similar. Rumour has it the Campbells had the stone dropped into Loch Sween, somewhere offshore. Now, I again caution you, I am not a historian. So, do your own fact checking, please. I first visited Castle Sween in the '90's. The caravan park beside the castle was still a small and welcoming place. I found this visit to be less welcoming. I am not sure of the why's, but the fact is, if you wish to visit this beautiful ruin you have to park your vehicle on the public road and walk in. The walk in is pleasant on a paved road, it is the principle that has rubbed me wrong. I will get over it. Just be fore warned. The new camera sure did capture the extreme of the greens of the grass and the contrasts of the grey stone and skies. These pictures were very vivid. You can almost imagine what it would have been like to reside here....almost. The roofs and inner woodwork maybe missing, but I can imagine what this castle must have looked like in its glory days. This would have been a tough castle to get to, without a vessel of some kind. Even today, with paved single track it is not easy to get here with an automobile. Much less, trying to ride cross-country on horseback. The biggest changes I noticed between my two visits were the number and locations of chain-link fences and the changes to the signage. I am not sure if this is a Historic Scotland site, but my pictures from the '90's had more signs on the grounds. Also, in the 90's more of the castle was accessible, like Sween's Tower. This was a long day for us. We started our day in Ullapool at the Broomfield Holiday Park, before driving to Inverness and back across the Great Glen to Fort William. Then we made haste for the Kintyre Peninsula. We drove a different route in the '90's, but the route we took was equally as pleasant. We departed Fort William around 1420 hours, arriving at Castle Sween, not sure forgot to write that in my journal. We finished taking photos at Castle Sween around 1815 hours and made our way to Kilmory Knap Chapel to take pictures of the MacMillan Cross. (That will be a different Blog post.) We depart Kilmory around 1850 hours and went to Lochgilphead, Argyll Pizza & Cafe for a late supper. After supper we made our way back to Fort William. After driving around Fort William a few times (2347hrs) and finding no room at the inns, we headed for Glen Nevis in hopes of finding a camping spot. We finally, found a friendly place called Glen Nevis Caravan Park. By 0130 hours we had camp pitched and twelve minutes later we were all sawing logs. Later that morning we would climb Ben Nevis. I promise to post that adventure in due time. Until next time.......research some family history and go explore!!! The Cubist Escape has become a pack to hold radio gear. So, for all my friends who are operating (or are planning to operate) HAM radios in the field.....this project is dedicated to you. Today, we built a lightly armoured HAM Radio Antenna Carrier. 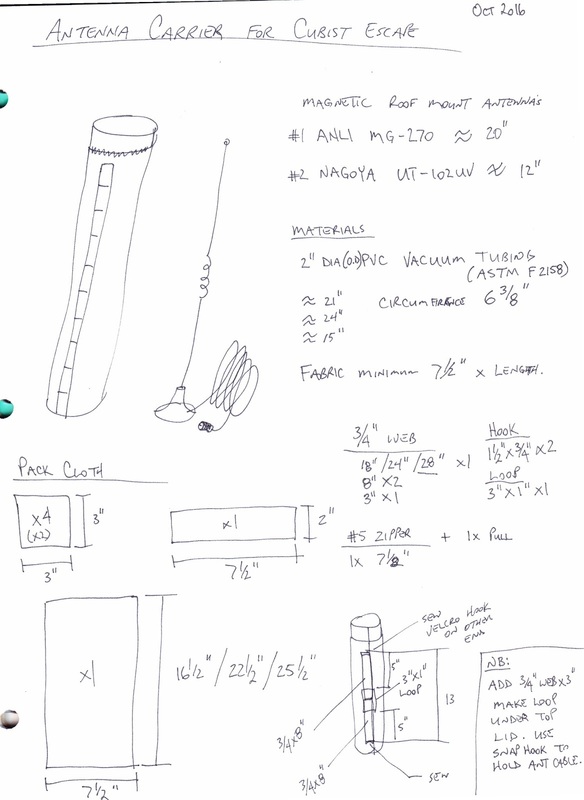 Read on for more details......I will try to post the plans, upside right this time. Yes, the plans are now a part of this post and they arrived exactly where I needed them. That was a nice change. 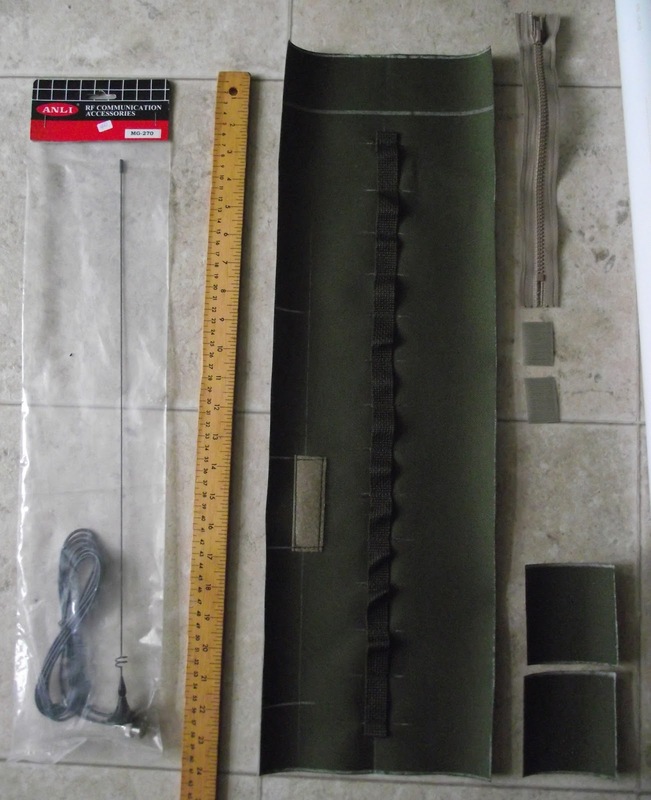 So, if you have a portable HAM radio unit like a Baofeng or something similar, then you probably have a magnetic base antenna to attach to the roof of your vehicle to increase the range of both receiving and transmitting. But, how do you safely transport said antenna when it is not on the roof?? You need a pocket or pouch that you can attach to your radio ruck that both carries and protects your antenna from unintended abuse while in transit. 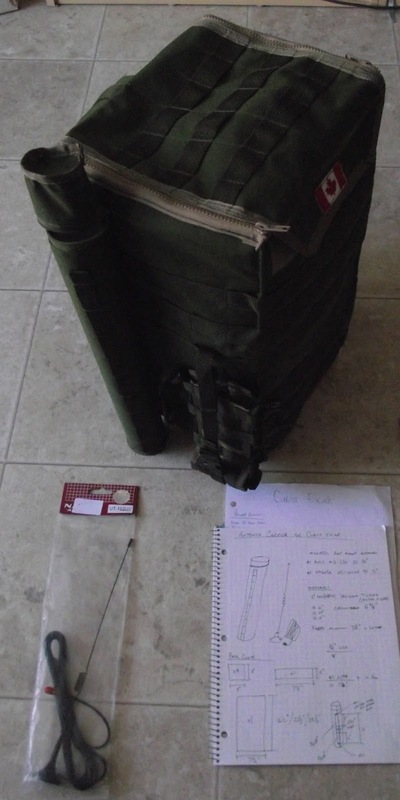 To this end, I give to you the HAM Radio Antenna Pouch for your ruck. For armour, we have a piece of 2" O.D. 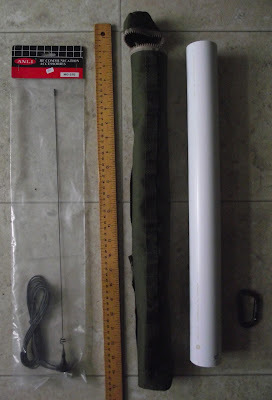 PVC Vacuum Pipe cut a wee bit longer than the height of your antenna. Now, you Red/Green fans can go ahead and complete this project with just Duct Tape, but the rest of us want function and fashion. 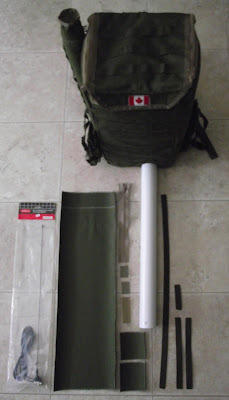 To attach this PVC pipe to the pack we need to build a fabric pouch to hold the pipe in place. The PVC pipe is tough enough and light enough to both protect and hold its shape. I am currently out of my normal building material 1000 denier Cordura, so this project was built with 600 denier PVC backed pack cloth, tough enough and then some for this project. In fact, if you had ripstop parachute cloth, that would work, especially if your mission requires extreme light weight gear. The PVC pipe is doing all the real work, the fabric is only acting as a means to interface the pipe to your ruck, in a convenient way. We need a couple of measurement before we get too far in the layout process. First, how tall is your antenna?? Second, will your magnetic base fit inside a 2" O.D. PVC Vacuum Pipe?? Third, what is the outside circumference of the pipe you are using?? 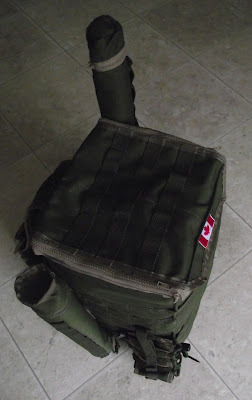 And finally, how will you attach this pouch to your ruck?? 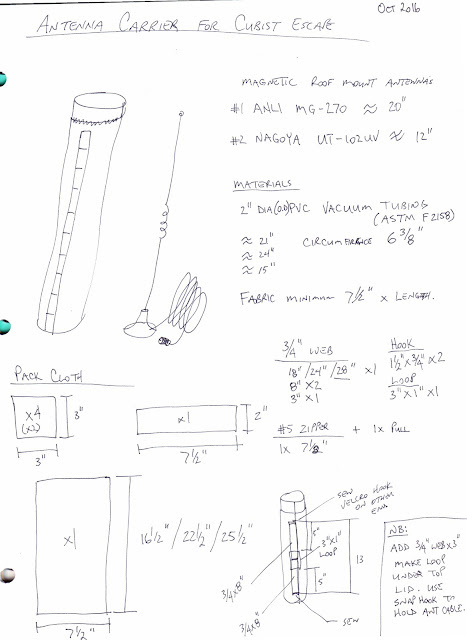 #1: Antenna: Nagoya model: UT-102UV is about 12" tall. 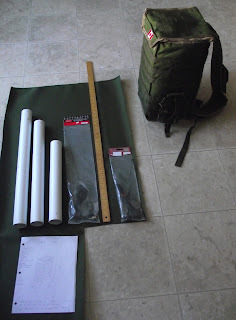 #2: Yes, the base will fit inside the PVC pipe. #3: Outside circumference = 6 3/8"
#4: Basic 3/4" webbing and Velcro, through the MOLLE style webbing on the side of the ruck. I start with a 15" piece of the 2" PVC pipe. The fabric required must be 7 1/2" x 16 1/2" to cover the tube and allow enough room for seams. The zipper will hold the top cap to the fabric lower. The top cap only needs to be 2" x 7 1/2". The ends of the fabric will be closed with either a single or double layer of pack cloth. 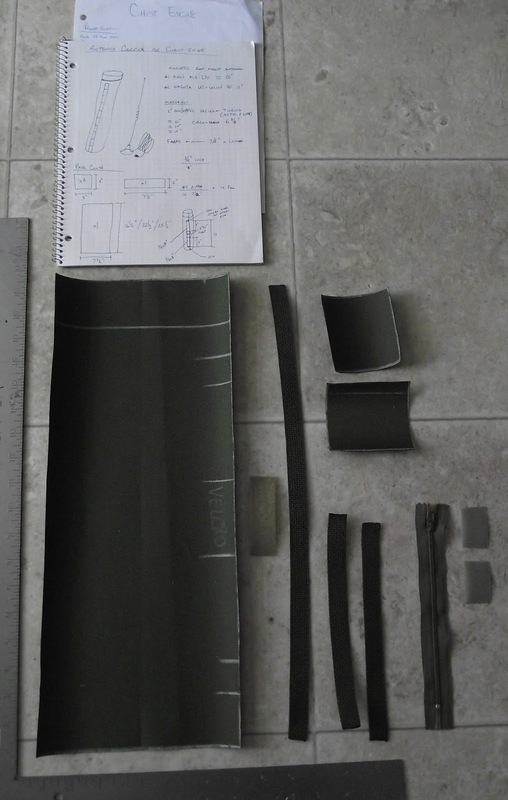 Since, this antenna is so lightweight, I opted for a single layer top and bottom. In case I need to share this antenna with anyone, I wanted a webbing strip to feed anchor straps through. 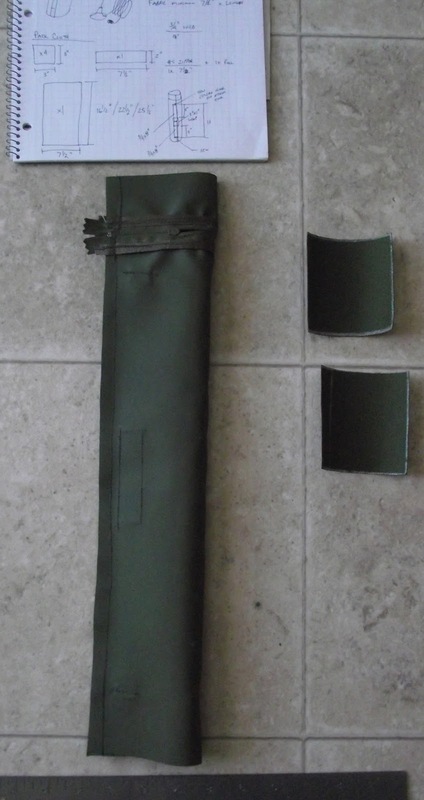 This was achieved by adding a 3/4" webbing sewn at 1 1/2" intervals down the centre line of the pouch. The anchor webbing and Velcro be inset about 1/2" from the edge, so you can sew past it when sewing the main seam. You can do this on either side, it depends which side of your ruck you want your antenna pouch on. This one ends up to mount on the left side of the Cubist Escape. Next one will need to be the opposite to mount on the right side of the Cubist Escape. 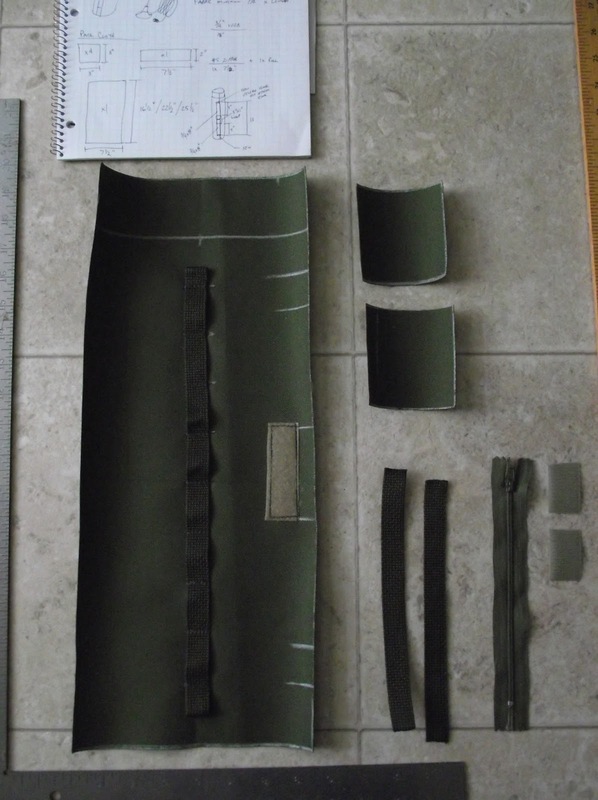 Once, all the outside work is completed, it is time to assemble your pouch. Start with the main seam. Goodside to goodside, sew down the seam. I use the edge of my machine's foot to gauge the allowance. I sew tight allowances, so for me on a project like this, a bit over an inch more than the size I want will do. If you use large seam allowances, you may need to add more when you layout your design onto your fabric. 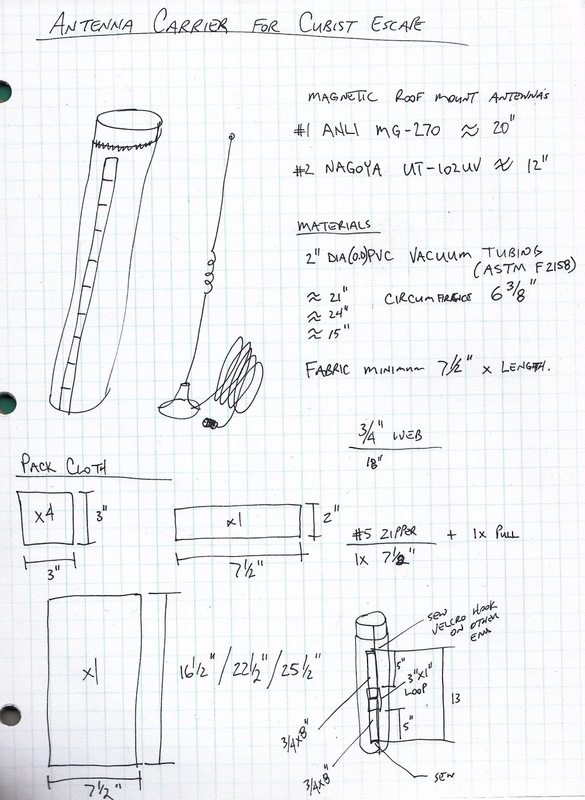 This first project I had to design and build the proto-type. Now, that I know the seams work; the next one will utilize inside seams for the ends. Once I had reversed the material I knew I did not want to do that twice more. All-in-all, I am quite happy with how this pouch turned out. It fit on the Cubist Escape well. And, I believe this pouch will protect my antenna well. My only concern with outside seams on the top and bottom of the pouch is that rain or snow may collect and seep through.....although, I am not sure the antenna would be affect by some moisture. 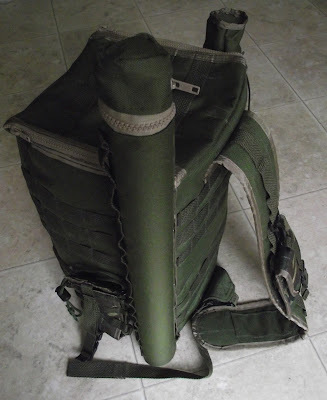 Well, when you need gear and cannot find or afford it.....you may as well make it. Until next time, design and built something!!! 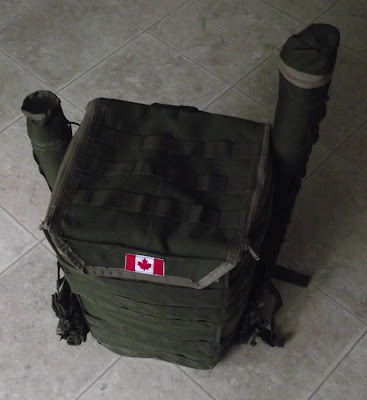 Update: Due to the new pouch being called the ANT 21, this pouch should be called the ANT 16. Ardvreck Castle, along the A837, on the shores of Loch Assynt, Sutherland, Scotland. 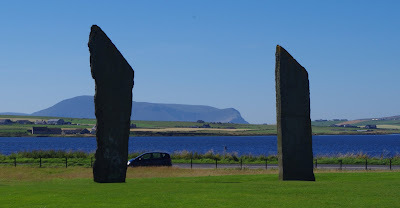 For those traveling the North Coast 500 (https://www.northcoast500.com), this is a must stop and take a picture location. We happened upon Ardvreck Castle and even from a distance, this mysterious ruin had our attention. So, strong was the attraction that we stopped at a distance to capture our first images before finding a pullout to park at, so we could explore the grounds of the peninsula/island (depending on water levels) which the castle is located. Again, I must warn you I am not a historian. My quick check of Wikipedia helped me to learn this was once a Clan MacLeod stronghold. I find that interesting, but I am here to take pictures. If only I had time to return when the skies are blue and the crowds are few. And pictures I did take.....about 90 images were captured here. From that I have tried, with minimal success, to pare that number down for this post. I believe the photos will do the talking on this one. I have more images than I have words to describe it image. I will say, I did enjoy this visit immensely, from the pleasant walk from the A837 along the beach, wading the ankle-deep waters onto the outcrop, as well as, my scurrying under the A837 to go take pictures of the nearby waterfall. Ardvreck Castle is a very rewarding castle to photograph. All of these images were taken within about 30 minutes or so, on an August afternoon. And depending on where the sun was in relation to the castle and the background I was able to capture the same castle with many different faces. I have had a few of these images printed and enlarged; Ardvreck Castle is very photogenic. I hope you enjoy these pics. I know, I enjoyed taking them. This was a great adventure and look forward to one day making a return. Until next time, plan an adventure and go! !